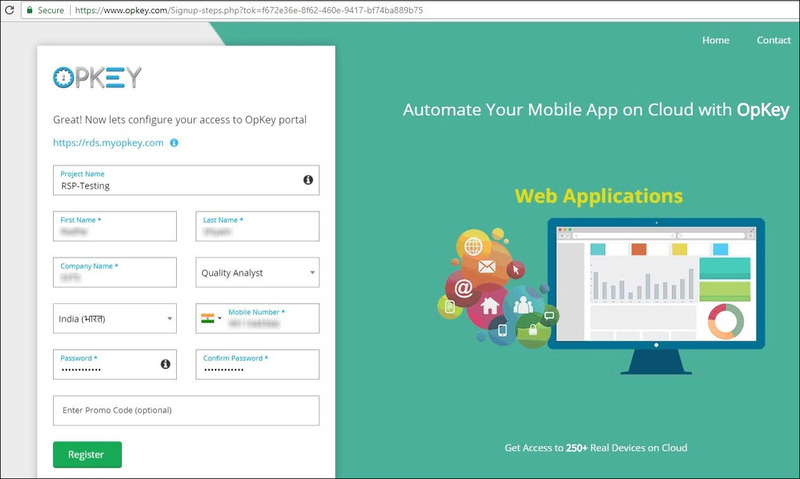 OpKey Web is now available with 30 days of trial period. Before accessing OpKey Web, you will need to register your account. After successful account registration, you will be given a complimentary trial of OpKey for 30 days. OpKey Account registration is an easy process and you need to follow just few simple steps. 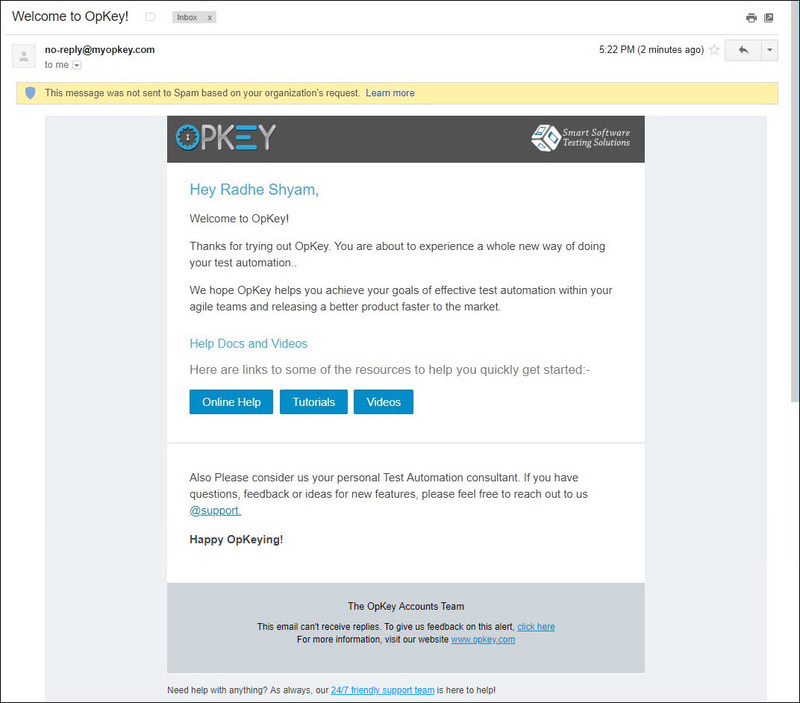 Go to the OpKey Sign Up page (https://www.opkey.com/Signup), enter your Business Email & check “I’m not a robot” checkbox as shown below. Your Team name must contain at least 4 characters (alpha-numeric). The given name will be the address for your team to log on to your OpKey portal. Enter your Email which must be a business domain name. Click on Sign Up. Here, you can view a popup message regarding sent verification mail on registered email id. You need to verify your account by clicking on the given verification link with mail. 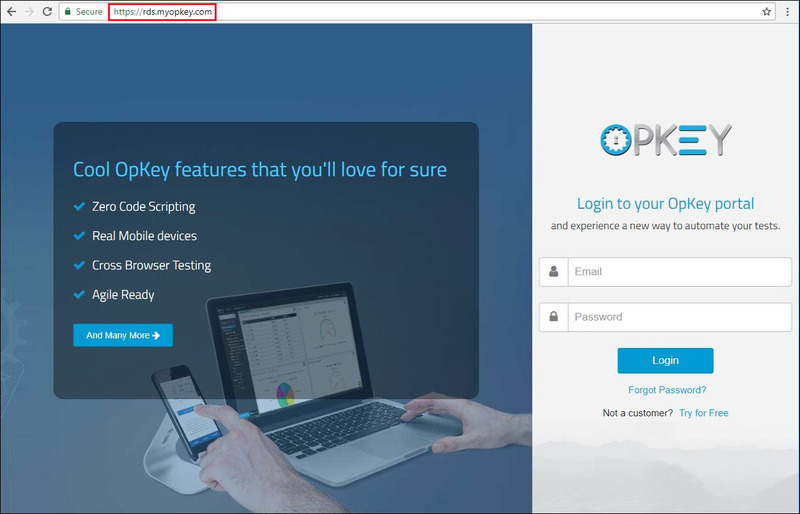 Before login to your OpKey Web portal, you must verify and activate your account. 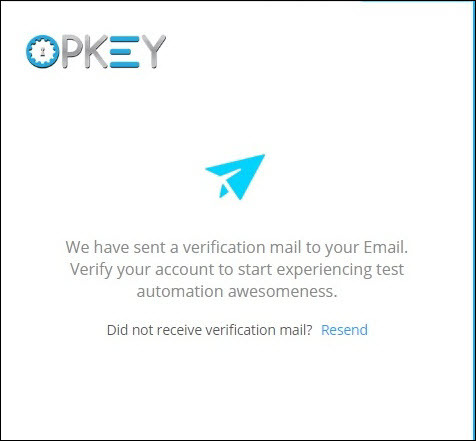 For this, go to your mailbox and verify OpKey verification mail. Here, you can view the sent verification mail to the registered email. Click on Click to Verify to verify your account. In this step, you are required to configure your OpKey portal. Fill all required fields and click on Register. Here, your OpKey resources are being allocated. It will take a while. Once, resources are allocated to your registered OpKey domain, you are redirected to your registered OpKey Portal. Fill your valid credentials (Email & Password) and click on Login. From here, you can select a Project upon which you want to work. There is a CrestShop Sample Project – Team which includes some pre-built artifacts. 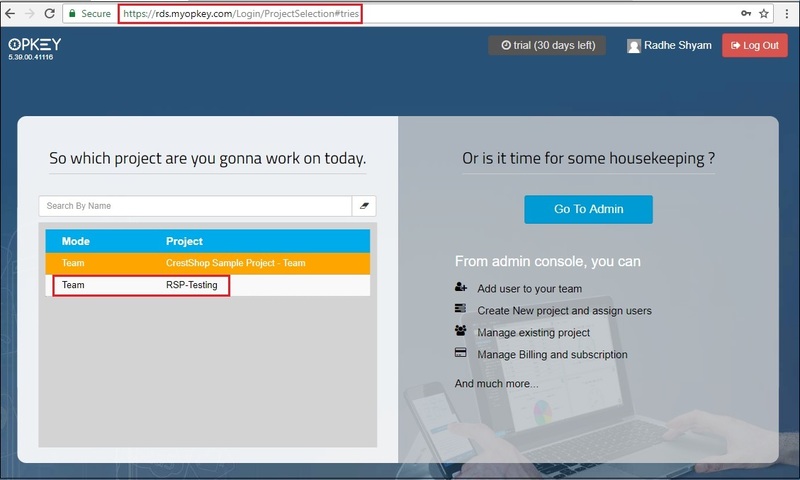 You can select your own created Project (here, RSP-Testing). You can go to the Admin section to manage users, projects, agents etc. 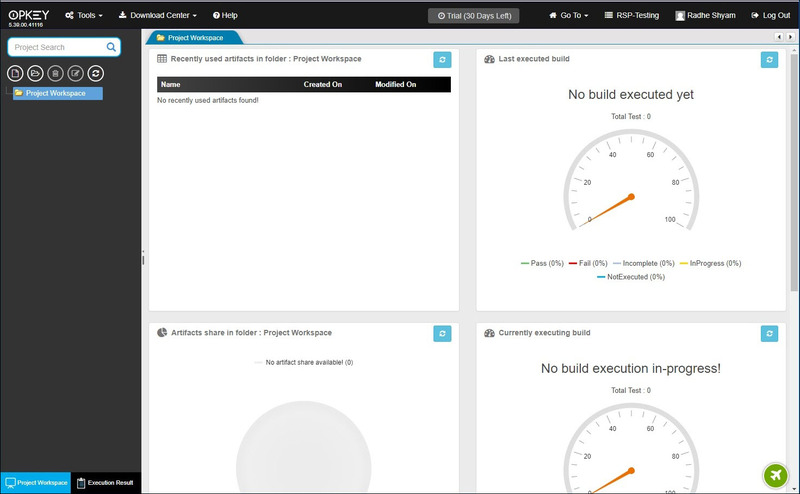 Here, you can view the OpKey Web dashboard page. 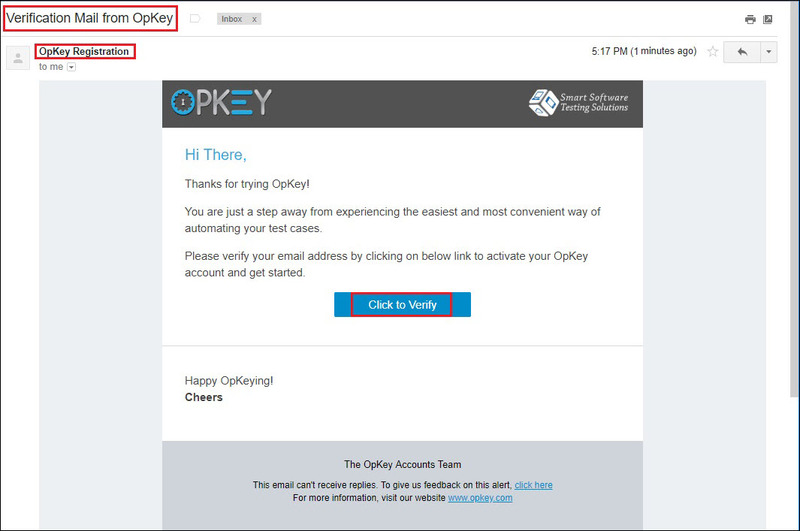 Just within few minutes, you receive a welcome mail from OpKey. It contains few important help links (Online Help, Tutorials & Videos). Once all the above mentioned tasks have done successfully, you need to download OpKey Execution Agent and configure it and then execute your test. Go to the Download Center showing on OpKey dashboard and download OpKey Execution Agent. To work on OpKey Web on supporting web browsers (Mozilla Firefox, Google Chrome, Internet Explorer etc.) 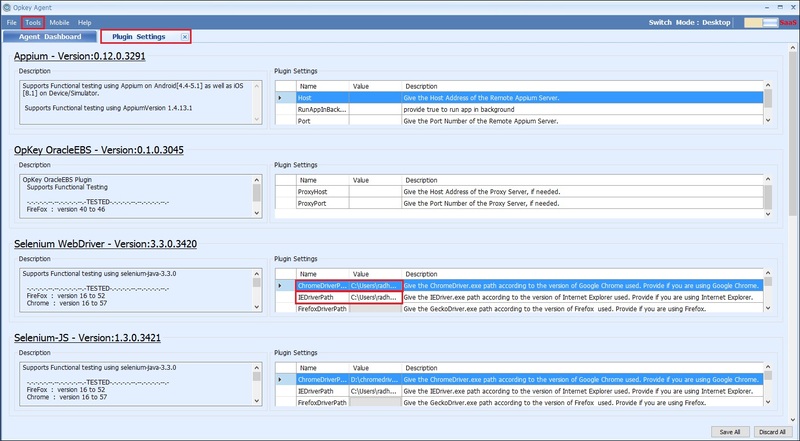 for execution, you need to download & locate respective drivers on your machine. To download supporting web browser drivers, refer: http://www.seleniumhq.org/download/. Before downloading and locating these drivers for execution on OpKey Web, make sure that OpKey supports those drivers successfully. To get detail information about the supporting Selenium version and different web browsers, follow below step..
Place downloaded drivers to a particular storage location in your system and set location path in OpKey Execution Agent (As shown in above image). Make sure that these drivers are located at the configured location. Save all changes to the OpKey Execution Agent and relaunch it. While working on OpKey Web, you can view number of remaining days of your trial account period.